I don't find Adam Carolla particularly funny. Never have. So that's a fairly major obstacle that ROAD HARD, the new film Carolla stars in and co-wrote and directed, has to overcome with this reviewer. It does so largely by being a personal and surprisingly sweet little film about a once popular comedian, Bruce Madsen (Carolla), who has fallen on hard times both in terms of his career, and life in general. Once co-star of the popular “Bro Show” and other TV programs, Bruce's star has faded and he finds himself back on the road doing stand-up in mid size comedy clubs, flying coach, and living out of hotel rooms. Even when he's back home in L.A., Bruce is stuck living in a garage, his ex-wife and her new beau occupying the main house along with Bruce's daughter Tina (Cynthy Wu). On top of everything else, Bruce needs to come up with a way to pay for Tina's college tuition. So he takes whatever gigs his oddball manager “Baby Doll” (Larry Miller) can get him, even a job warming up the audience for his former “Bro Show” partner Jack Taylor (Jay Mohr), now a popular late-night talk show host. That's gotta' hurt. While working yet another questionable job, Bruce meets Sarah (Diane Farr), a middle aged widow from New Hampshire who strikes up a conversation with the down on his luck comedian. The two hit it off and eventually start dating, but can Bruce still chase after Hollywood success and carry on a long distance relationship with a New England girl at the same time? And does he still even want that success? The plot is a familiar one, but the authenticity of the details and genuine emotion contained in ROAD HARD make it a respectable “B” grade rom com. Carolla doesn't exactly stand out as a master thespian, but he does a decent enough job essentially playing himself, and what he lacks in star power he makes up for in regular guy likability. He undermines his appeal on occasion with some of his more juvenile (and, in the opinion of some, sexist and homophobic) material, but enough of the jokes hit their mark to say that the film works as a comedy. 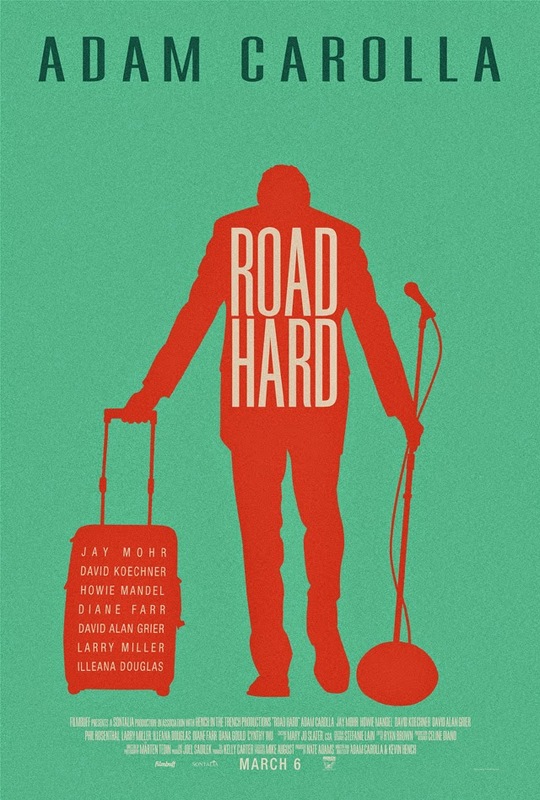 I went in expecting to hate ROAD HARD, and hate Carolla in it, so he must have done something right. those who are already fans of the guy should find it even more to their liking. 2 ½ out of 4 stars. 2 and 1/2 stars doesn't quite cut it. But it's hard to blame someone for rating a movie better because he hasn't quite created anything but a caustic relationship with the media.